I always struggle to remember what we’ve done over the last week when I come to writing the weeks Living Arrows post. Looking back on old Living Arrows posts though I do think that it’s a wonderful idea, as it means I remember and relive some of the little things that we do with Isla that I think otherwise we would have forgotten. So here’s this week’s living Arrows post so that I can remember in the future as to what we’ve been up to. This week Isla seems to have decided that she absolutely loves drawing. Most of them just look like a unicorn has thrown up all over the paper as she uses every colour pen possible. She also quite likes drawing on my table, thankfully it’s got a wipe clean table cover! We’ve got so many pieces of paper with “drawings” on, and I can’t quite bring myself to throw any of them away yet so there’s a big pile of them in our living room. On Thursday we went to Odd’s Farm as we love to do. We met up with one of my friends from our NCT group who also has a 3 week old baby boy now. He is absolutely gorgeous and as little babies do, slept through the whole time we were at the soft play. After the kids ran around a lot at the soft play we then went outside to have a look at the animals. Isla was really brave and fed the sheep and the goats, with a little bit of encouragement. And then she went over and stroked the rabbits, which she absolutely loved. On Friday we went into town and signed Isla up at our local library and did a little bit of shopping. In the evening we met up with friends at our local pub which is always lovely to do and Isla absolutely loves playing with their kids. It’s so lovely watching them grow up together. Saturday was a bit of a wash out because of the rain, but we got quite a lot of jobs done around the house which was great. Sunday we headed down to the allotment. It feels like it’s been ages since we’ve been down there, but we got quite a lot done. I completely cleared and weeded the cucumber, and pea beds, with a little bit of help from Isla. Meanwhile Chris was clearing space so that we can put up a big plastic greenhouse so that we can start off all of our flowers and veg etc next spring. We also pretty much dismantled the old compost heap that was on the new half of the plot. Which turns out housed half the world’s population of snails in there, as well as a toad. We have moved probably about half to two-thirds of the compost from there into the new compost bins that we built when my mum and dad were here a couple of months ago, and already that half of the plot looks so much bigger. 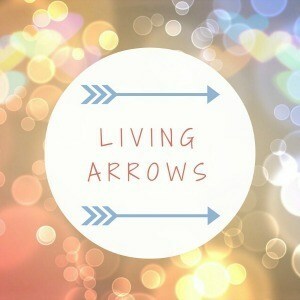 I love this week’s Living Arrows photo. It was taken on Thursday evening while waiting for Chris to come home. He was stuck in traffic, so I started cooking dinner early as Isla was really grumpy because she decided she only needed half an hour’s sleep. Wonderful! 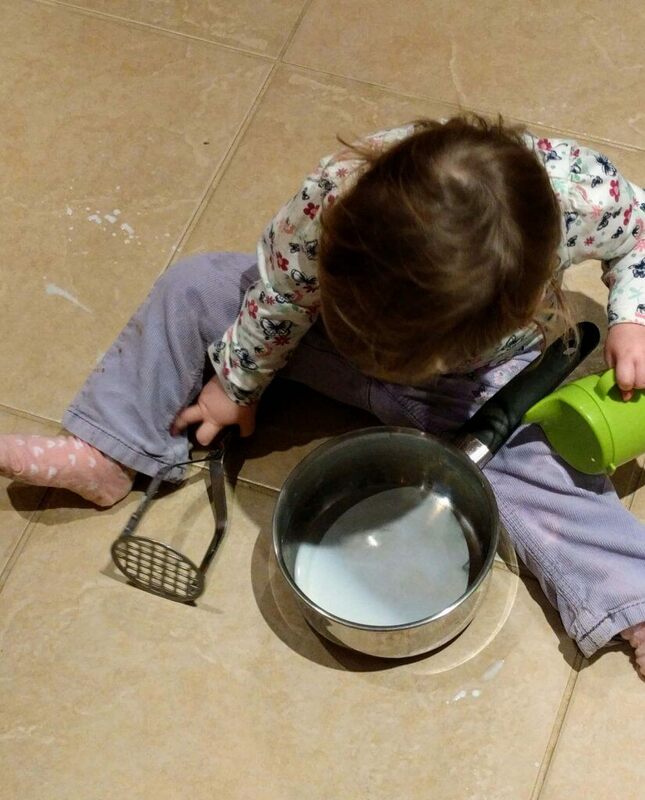 Isla has desided she quite likes playing with one of our pans and the potato masher for some strange reason. 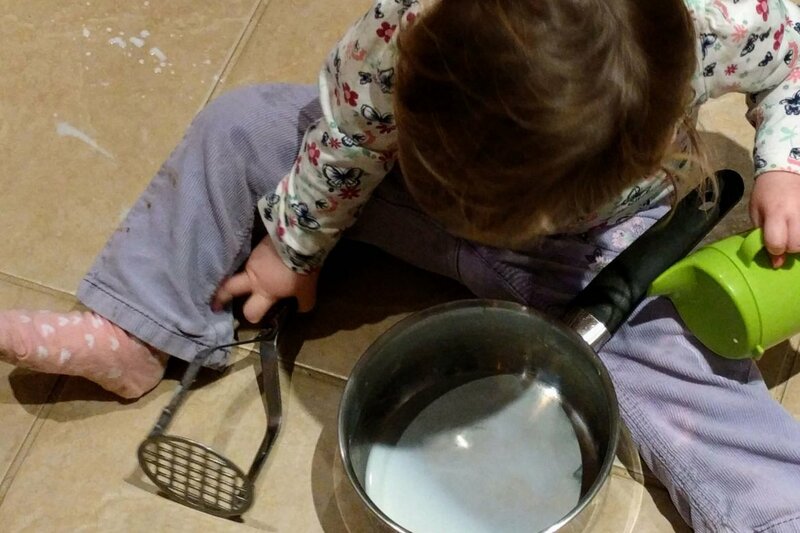 This then turned into tipping her cup of milk into the pan and “mashing” it. But she seem to love it and I just decided, despite the fact she was making right mess, to go with it. She was happy and I could cook in peace. It was really funny to watch her play with it though, as every now and again she would look up at me with a big grin on her face as if to say I know I’m not meant to be doing this but it’s fun. She’s definitely getting more and more mischievous, and she knows right from wrong, but usually still does it anyway. It’s so nice to watch her grow up and see her personality develop. Great picture, we had a kitchen cupboard that was devoted to play saucepans, utensils and play plates etc. My two absolutely trash it whilst I cooked! Saucepans seems to be the best toys! Kids love them here as well. My girls love “drawing” as well and I have started to recycle them now. There’s only so much room I have to store them!